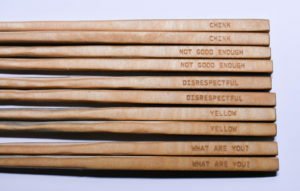 The Chopsticks Project – arts, ink. For a my first Sophomore Studio art project, I attempted to address my identity. I was born and raised in the United States, but a lot of my life has been influenced by my parents’ culture. At a young age, both my mother and father immigrated to American from Vietnam and haven’t been back since. In my generation, I believe it is common for young Asian Americans to feel uneasy in their cultural identity–we seem to be stuck between two worlds: Asian and American. We don’t always feel like we quite fit in, or maybe we can’t speak our own language, resulting in tension and shame. 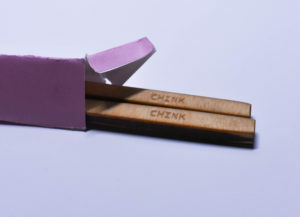 I created these engraved chopsticks and modern paper packaging to try to address these aspects of the Asian American experience. 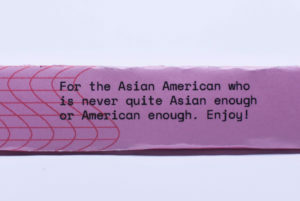 Several pairs focus on the model minority stereotype, and depict sayings that people say to Asian Americans, while the “Asian Disappointment” version detail phrases that parents may say to their children. I aimed to foster a sense of unity among Asian Americans and give an opportunity to reflect on and laugh at stereotypes. Hope you enjoy!